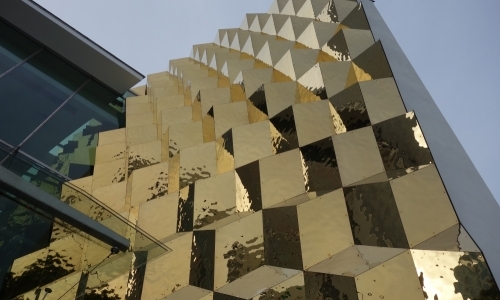 Therefore a 3D-facade consisting of gold-plated stainless steel sheets was developed. The total amount of 1600 sheets with a thickness between 1.5 and 3.0 mm are linked with special connectors and are fixed to the building with a separate sub-structure. The smoothly flowing geometry is a result of parametric modelling. The cladding has a total length of 46 m and a maximum height of 14 m.
The substructure was designed based on framework analysis, whereas the resulting stresses within the metal sheet elements including the connectors of the corners were analyzed using three-dimensional finite element models.